which I have no problem with. which I don't understand why should be called folded. Do people really call this position of the hands 'folded'? And can I ask why? - She kept her hands folded in her lap. As to why, I can guess, but I'm not sure. However, Longman Dictionary of Contemporary English and Oxford Learner's Dictionaries (AmE) give more specific definitions, which may not match the last image. 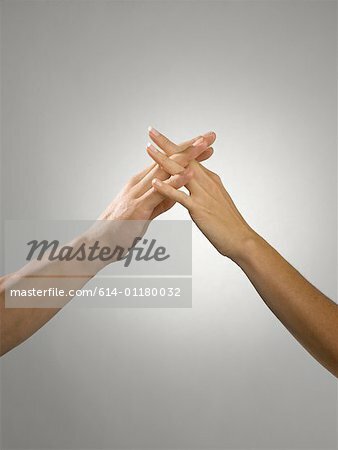 fold (verb) (tr) to bring together and intertwine (the arms, legs, etc) : she folded her hands. That said, I don't think intertwined fingers are required to use the expression. Other writers give a more practical reason; in his book entitled Learning to Pray, Den Slattery said that when his wife teaches children to pray, "they should fold their hands so they aren't tempted to tickle their neighbor." Regardless of why praying people put their hands together, my point is that any time hands are pressed or clasped together in a prayer-like gesture, we could probably use the term "folded hands" to describe them – even if the person is simply relaxing on a sofa. I did a Google image search; interestingly enough, all of these pictures had the phrase with folded hands somewhere in their caption. If you pretend that your hands are pages of a book and hold them palms-up, the hands can be considered to be open. Googling for "open hands" images will show many more such pictures. If you now mime the action of folding the book shut, you can be said to fold your hands. Your first two pictures might be better termed clasped hands, though there is some latitude to the term folded hands, as you have observed. 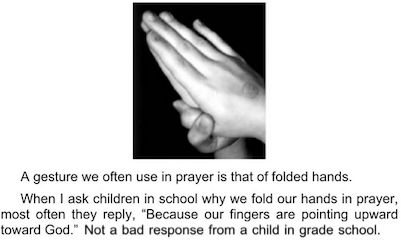 For the third picture, "hands placed (put) together for prayer" would be more idiomatic than folded hands. To fold basically means to bend or to cover or wrap something in and the third picture doesn't show any part of a hand folded. "She kept her hands folded in her lap." could be interpreted as the following picture. Note: When you Google images for "locked hands", there are pictures of various hands including handcuffed (or chained) hands. It is not easy to tell which image is described by just reading a word or phrase . What does “… somebody who's gonna call you out ” mean? What does this use of “tingling” meaning? What is a “cut it up poster”?